SEBASTIAN PLAYS THE CHORDS: you should know this great man. you should know this great man. 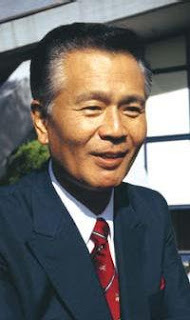 Gunpei Yokoi (横井 軍平 Yokoi Gunpei?, September 10, 1941 – October 4, 1997), sometimes spelled Gumpei Yokoi, was aJapanese video game designer. He was a long-time Nintendo employee, creator of the Game Boy and Game & Watch handheld systems, inventor of the modern day D-pad or 'cross' pad (a design that nearly all video game controllers use today), and producer of several long-running and critically acclaimed video game franchises. Now for a tiny update: I am still at work on a big budget production (August: Osage County) in Bartlesville, OK awhile longer but I'm always thinking and working towards bringing more creations from Sebastian's world to life... another short film is in the works so stay tuned and Reach for the Stars! !